The Verizon Wear24 is definitely one of the more interesting Wear smartwatches out there. Announced on the same day as the LG Watch Style and Watch Sport, it took three months to go on sale, four months after which it was permanently discontinued. Since then, we've seen it steadily dropping to insanely low prices, though the current figure of $49.99 does seem to be the bottom line. Nonetheless, it still represents the greatest value for money of any Android Wear/Wear OS watch. Specifications include a 1.39" 480p OLED screen, a Snapdragon 2100, 768MB of RAM, 4GB of storage, and a sizable 450mAh battery. Also on board are LTE, GPS, NFC, and Android Wear 2.0. That all being said, the watch band isn't removable, and the NFC doesn't support Android Pay. But hey, the thing is $50. The watch is available in any of its three colors (Gunmetal Black, Rose Gold, and Stainless Steel) as of publishing time. Over 1,500 have already been sold, and eBay's showing the "Limited quantity available" indicator (but who really knows what that means?). 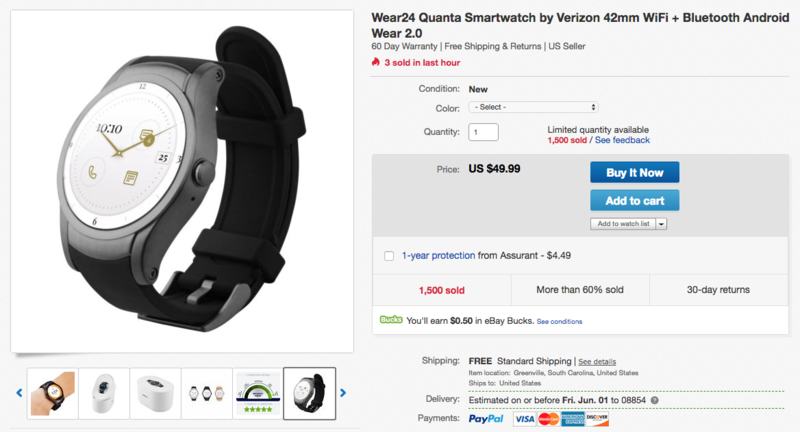 The seller offers a 60-day warranty, free shipping, and free returns within 30 days. So if you just want to check out a Wear OS watch - one with pretty good specs at that - the Wear24 might be a good purchase.